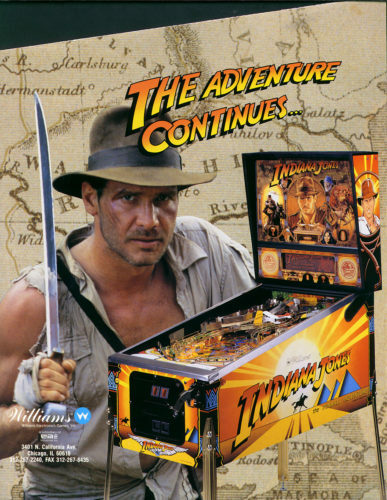 Indiana Jones – The Pinball Adventure – Pinball Machine (Autographed) | Fun! It is a 6 ball multiball game. Players try to complete various modes through the original movie trilogy in an attempt to reach the wizard mode. Gain access to the player controlled tilting mini-playfield aka “Path of Adventure” and avoid the Pit of Doom. This game has been fully restored by our in house team and it looks and plays amazing. You would be hard pressed to find a much better looking example of this title! This game needs absolutely nothing except a corner in your gameroom and for you to take the challenge of beating the high score. – Cabinet stripped and sanded and brand new side art, leg protectors and side rails installed. – New drop target decals installed. – Playfield torn down of all components and playing surface cleaned and polished. – All plastics and posts have been cleaned and polished. – Brand new balls installed and new rubber rings throughout playfield. – Brand new Raise Jackpot and Slingshot plastics installed. – All playfield and backbox illumination upgraded to premium non-ghosting LEDs. – General Illumination pins and connectors rebuilt on Power Driver Board. – New custom instruction cards & free play cards. We had the pleasure of meeting actor John Rhys-Davies who played Indiana Jones’ friend “Sallah” in Raiders of the Lost Ark & The Last Crusade. He autographed the backglass/translite on this machine. See pics! Indiana Jones has been fully checked out by our full time technician. All switches, bulbs, coils and assemblies are working 100% as they should. Includes 30 day parts/labor warranty. Rare opportunity to own this desirable Indiana Jones Pinball Machine. Hurry as this title never lasts long in our inventory.